The opening event of the Cool Climate Chardonnay Celebration (i4C), School of Cool, kicked off with a session on soil. Dr Paul Anamosa began the session talking about the impact of soil on wine flavour. What does the soil provide to the vines? What does vineyard management have to do with this? Paul talked about what the soil provides to the vine. It contributes nutrients, water and the anchoring of the vine to the ground. There are essential macro and micro nutrients. Some are added to the soil or vine as fertilizer: nitrogen (taken up as nitrate, postly), phosphorus (phosphate ion), potassium, calcium, boron, iron, zinc, copper and manganese. Some are better applied as foliar nutrients because they if you add them to the soils, they are complexed and aren’t easily available to the vine. When it comes to other things, small molecules such as some pesticides can be taken up by the roots, but other elements – such as kaolinite, a component of clay – are too big and can’t be. Some minerals are desirable in small quantities, but not in large ones. For example, high juice potassium can be problematic, because once you are over 2000 ppm you get very high berry pH. Some rootstocks hoard potassium such as Riparia 101-14, so you don’t want these in high potassium soils. High calcium can be good, because it increases cell wall strength which makes the berry skins thicker. Low soil nitrogen reduces YAN levels and this can cause fermentation problems. Paul didn’t really explain how different soil types affect wine flavour. He emphasized the importance of water management, which has an impact on canopy, berry size, structure of the berries, and even berry chemistry. He mentioned minerality, which is a metaphor, and he’s not keen on metaphors in describing wine. Minerality is not caused by the uptake of minerals into the berry, says Paul. There were some questions that Paul addressed. The first was about the importance of limestone. He says that it doesn’t give up its water easily – the smaller the pore the harder it is for the water to be sucked back out by the vine. So small pore structure manages the supply of water to the vine in a steady, slow way that will affect flavour development. Most uptake by the roots is basic elements and water. It’s the horticultural effects of water management gives the most impact. He was also asked about the effect of using herbicides. ‘We see suppression of soil microbiology with herbicides,’ he said. ‘And when you kill off weeds all the time the soil starts to lose its organic matter. Soil organic matter has a half life of around 1000 years. If you add compost 99% is gone in the second year, only 1% remains as soil organic matter. If you kill off the weeds then the organic matter depletes and the soil becomes hard and crusty.’ This lack of organic matter means that there’s no soil life. But he adds that soil microbiology still isn’t well understood. We then had short presentations from each of a number of winemakers who were showing wines, and we tasted 10 Chardonnays blind. The idea was that we should try to match each Chardonnay with specific soil types using the Sli.do website/app. While it was interesting to taste the wines blind, it was impossible to do the matching because we just didn’t have enough information to try to match flavour and soil. 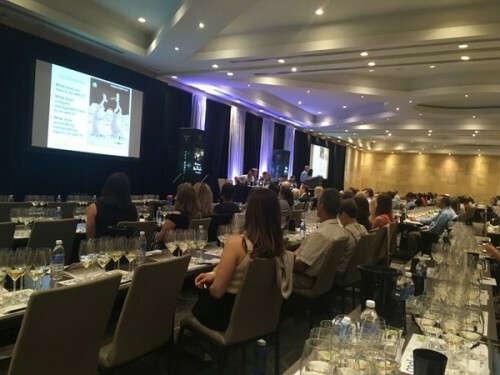 ‘Is anyone else getting the sense that this is perhaps futile?’ moderator John Szabo joked as the wines were revealed and we clearly were guessing at random. A bit musty? Has a mushroom edge to the nutty, mineral, herby notes. Pear and apple fruit. It’s a little corked.